If there’s any city where an oyster-centric happy hour makes sense, it’s New Orleans, where fresh, salty Gulf oysters make our restaurants thrive. Alcohol and bivalves make for a great combination, hence this list of Thrillist-approved happy hours where you’ll get great deals on both. If you ask in-the-know oyster lovers where to go, this beautiful spot from Chef John Besh will rightfully be at the top of their list. Happy hour happens every day from 3-6pm, with 75-cent oysters on the half shell, $1.25 fried oysters, and half-price beers, cocktails, and wines by the glass. It’s popular among locals and tourists alike, so get there early to stake your spot. Head to this narrow seafood joint adjacent to the Ace Hotel for a killer oyster happy hour. From 4-6pm Monday through Friday, get a half-dozen wild Gulf oysters for $6, along with deals on other raw bar items and specialty cocktails -- and $3 High Life pints. From 4:30-7pm Monday through Friday, snack on dollar raw oysters or a trio of roasted ones for $7, and wash them down with $5 glasses of wine, Old Fashioneds, and Mai Tais. 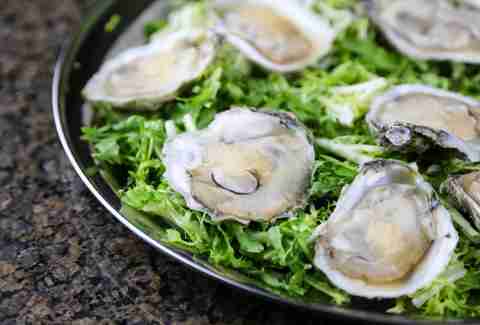 From 3-6pm every day, enjoy 75-cent raw oysters at this hotel restaurant that has some of the best seafood in the city. The regular menu offers over a dozen styles, including chargrilled with Champagne and broiled with smoked Gruyère and pancetta, so after a few rounds of the discounted wines or beers, you might be tempted to splurge on another platter. Monday through Friday, from 4-6pm, check out this casino and riverfront-adjacent seafood restaurant for 75-cent oysters on the half shell and $7 1/2lbs of jumbo boiled shrimp, with cocktails, draught beers, and wines by the glass at half price to wash it all down. 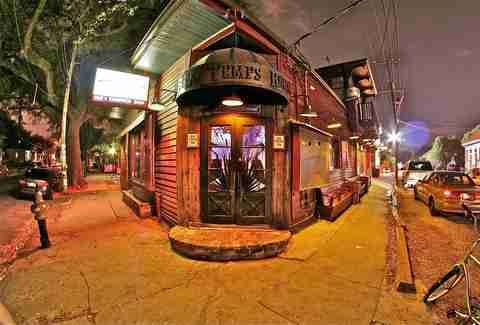 Happy hour is held here every damn day of the year, including Christmas, New Year's, Mardi Gras, and the Super Bowl. 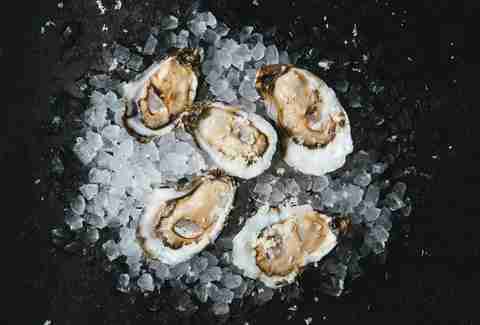 It’s from 4-8pm, and when you buy one alcoholic drink, you can also get a dozen raw oysters for just $3. Chargrilled oysters are also available with the same drink-per-dozen caveat, except that’ll run you $10. Located right off the streetcar on St. Charles, the Blind Pelican also has a large outdoor patio to take in the sights and sounds of the city. 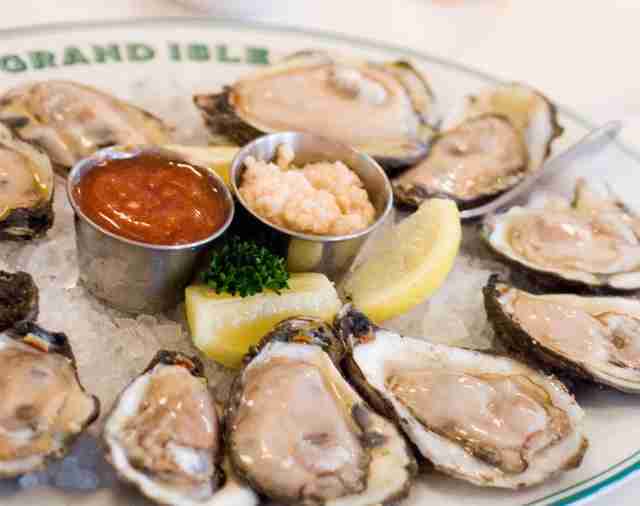 The Bourbon House has a more highfalutin happy hour with dollar oysters on the half shell, but that’s still a bargain considering its location within the Quarter. Along with oysters, enjoy $3 Abita drafts and keep this in mind -- even though you’re on Bourbon Street, don’t bring your Hand Grenade in with you. Up St. Charles at Napoleon, sit back every weekday afternoon between 4-6:30pm and slurp down 50-cent raw oysters, two-for-one frozen mojitos, half-price bottles of wine, and $3 draft beer. Even the people who work there stick around after their shift to get in on this deal. An upscale seafood restaurant that’s part of the Ralph Brennan empire, Red Fish Grill offers 50-cent oysters, and two-for-one draft beers, well cocktails, and glasses of house wine, Monday through Thursday from 3-6pm. This Uptown institution has a splendid, gleaming raw bar that’s been operating since 1913. On Monday through Friday, from 3-6pm, you can get half-price oysters, bottled beers, glasses of house wine, and select cocktails in the old-school, mahogany-rich setting. 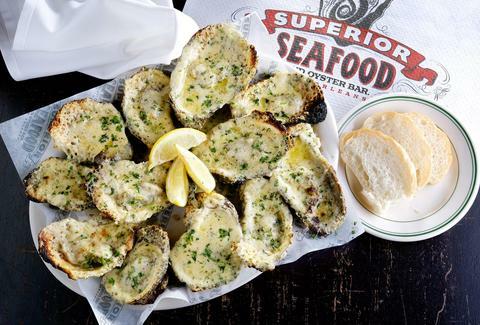 For 30-plus years, Le Bon Temps Roule has been serving free raw oysters on Friday evening, starting at 7pm until they run out, which is usually around 9pm or so. 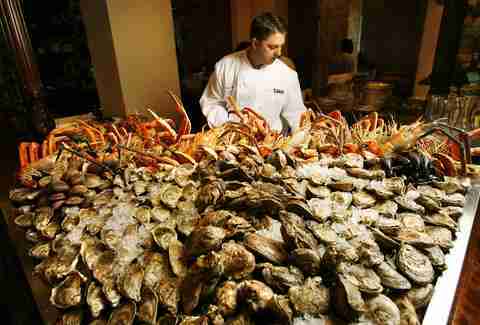 Enjoy the piano stylings of Joe Krown while eating these fruits of the sea, and remember to tip your server. 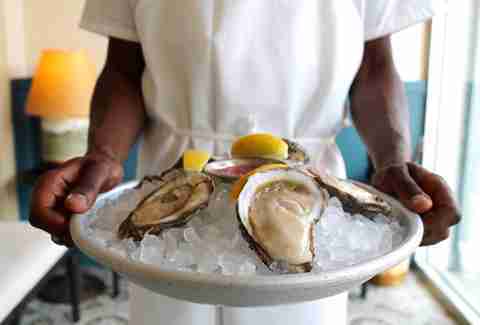 On Mondays, reward yourself on Magazine Street by stopping in at Basin Seafood to enjoy 50-cent oysters from 3-10pm. From 3-6, local beers are $4 and wines are $5, if you feel like getting there on the early side for some libations. Rather than call it happy hour, Kenton’s refers to its afternoon deals as “Early Bourbon.” It’s quite appropriate, given that the bar is named after the founder of the Kentucky town that first shipped the treasured spirit down to New Orleans. Featuring 75-cent oysters and cheap whiskey, such as a 2oz glass of Cabin Still for $1, the fun takes place every day from 3-6pm. This is the spot to get your cheap oysters on the later side of the day (or early, depending on when you woke up). Elysian’s 75-cent deal is seven days a week during the last hour of service, 9-10pm on weekdays, 10-11pm on weekends. This new bar right near Lake Pontchartrain goes above and beyond with its happy hour deal. 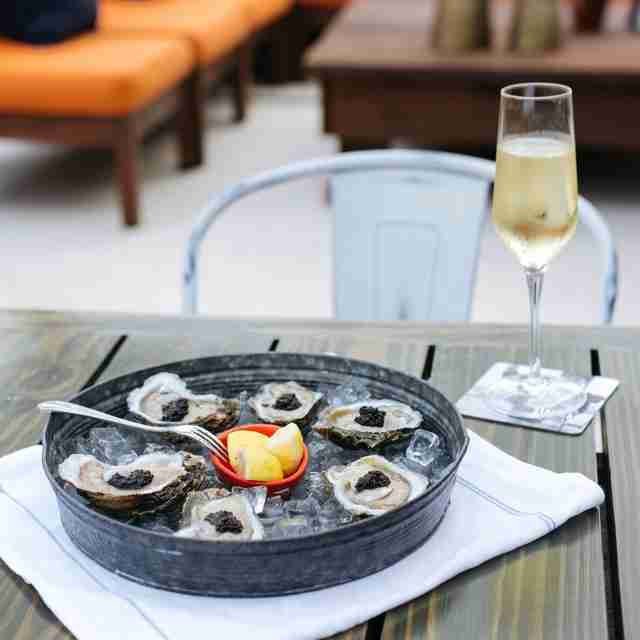 On Tuesday through Thursday, 3-6pm, get a half dozen oysters on the half shell, cajun caviar, and a glass of Lallier Grand Reserve Brut for $15. It’s the perfect way to wind down following an afternoon on the water. 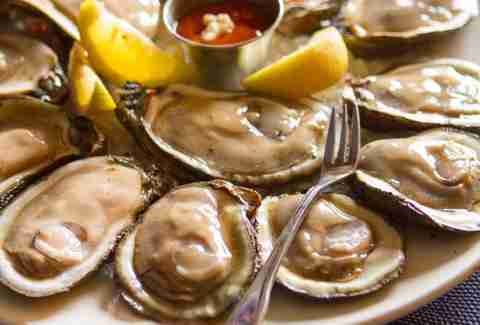 New Orleans resident and food/booze writer Nora McGunnigle's favorite oysters are from Murder Point in Alabama, so if you see them in a happy hour, you let her know right quick. @nolabeerblog (IG), @noradeirdre (Twitter).